What do you get when you blend Time Bandits’ quirky and awkward dwarf criminals with an attempt to imitate Tim Burton’s surreal setting of Alice in Wonderland (including Anne Hathaway’s awkwardly dark bushy eyebrows) with an attempt to have the charm of Princess Bride. Well then you get Tarsem Singh’s Mirror Mirror. Mirror Mirror is one of those movies you want to like, but you walk away from going, not quite. 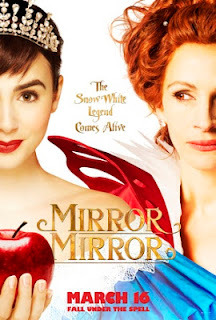 Lily Collins as Snow White is not quite Audrey Hepburn, Armie Hammer as Prince Alcott is not quite Brandon Frasier, and Julie Roberts is not quite the Queen of Hearts. Despite the quotable one liners, Roberts can’t pull off being evil without also being bitchy with an erratic English accent. She comes off more as a mean girl than truly evil. And our heroine? Despite her Rocky-esque fight training from the hodgepodge set of dwarves, and being badly in need of an eyebrow tweeze, she can’t even best the Prince she’s in love with without getting literally spanked. She’s simply adorable as he wallops her all over the snowy forest, but not at all a believable “queen” of bandits who wants the dwarves to play Robin Hood, again not quite the right story. What does the movie get right? Well the scenery and the costuming. It’s visually stimulating and the outrageous dresses Roberts wears are captivating. Visually the costuming is unique and creative. And the scenery? The wide span shots of the white woods, especially as Snow White runs in her white dress, truly beautiful. What else does Singh get right? The dwarves, the rabble rousing rapscallions are not Disney’s affable diamond miners, but when then dress up on stilts be long legged bandits, their acrobatics and antics are fun and usually goofiness ensues, even leaving Prince Alcott in his underwear more than once. I admire Singh’s attempt at toughening up Snow White’s image and even walk away admiring her when she locks the prince and the dwarves up to go save the day on her own, but the flat writing and one line quips from the Queen, as well as Nathan Lane’s (who undergoes a serious metamorphoses) campy humor, just can’t save this film from anonymity. However, I suggest if you do go that you hang around at the end for the little tip o’ the hat to Bollywood at the end.